We got a new cat yesterday. She has black fur. She is playful. She has fun toys. Polly was our old cat but now we have Lucca. A big stretch! A very nice looking cat. I hope you have lots of fun together. Do you think Lucca will scratch our couch? I am so happy that you get a new cat-friend. I love cats and Lucca is very pretty. Who feeds her? Do you brush her? She’s very cute Cate. Why did you decided to name her Lucca? 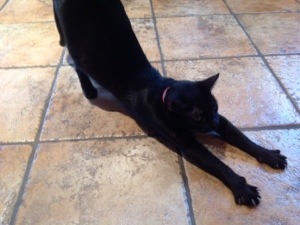 Do you know what type of stretch Lucca is doing there? I will give you a hint, it has the name of an animal that usually doesn’t get along with cats!